Get customised personalised plates specifically for your business. Business plates allow you to customise a design to compliment your business & brand. Add your logo, write your bottom message, choose your colours & combination. The possibilities are endless. Customise your plates now or let us help you by filling the enquiry form below. Thanks! We have received your enquiry and will be in touch. The plates are excellent value for money. Advertising is transient, if it's in the newspaper it only lasts a day, in a magazine a month but it sits unseen on a coffee table somewhere. Plates on the other hand are a one off investment that lasts for life. The combination formats available for Business Plates are 2-3 numbers followed by 3 letters or 3 letters followed by 2-3 numbers. If you wish to use a logo to separate your letters and numbers you will need to use only 2 numbers as the logo takes up the space character. Two sizes are available for custom and business plates, Slimline and Regular. Two plates, both a front and a rear, will be manufactured giving the opportunity to have both Regular, both Slimline or one of each. If you select a slimline size the sash message will not be shown on that design. If a Slimline size is required, we recommend you order both a Slimline and a Regular size to showcase your custom message or business name. 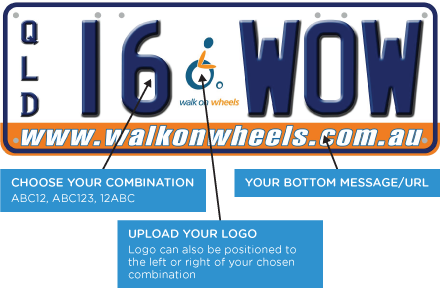 If you have an existing business plate design, you can remake your existing plates or purchase a new one. Contact our business representative on 3331 3205 for pricing and more information. After deciding on a design, there is a one off artwork fee of $385. This allows you to own a completely unique design to your business that no one else can use. Business plate fees start at $495 per set, this is a one off cost and allows you to own the design and combination as well as advertise your business. There are a number of payments available, the options are; credit card, cheque or money order or by cash or eftpos in our office.